A taco restaurant owned by Armando Moya, a Mexican immigrant, in Woodbridge, Va., outside Washington. He opened it in 2005, the same year he bought a house, which he has had to sell. WOODBRIDGE, Va. — Hispanic families accounted for the largest single decline in wealth of any ethnic and racial group in the country during the recession, according to a study published Tuesday by the Pew Foundation. The study, which used data collected by the Census Bureau, found that the median wealth of Hispanic households fell by 66 percent from 2005 to 2009. By contrast, the median wealth of whites fell by just 16 percent over the same period. African Americans saw their wealth drop by 53 percent. Asians also saw a big decline, with household wealth dropping 54 percent. The declines have led to the largest wealth disparities in the 25 years that the bureau has been collecting the data, according to the report. Median wealth of whites is now 20 times that of black households and 18 times that of Hispanic households, double the already marked disparities that had prevailed in the decades before the recent recession, the study found. "It's a very stark reminder of the high share of minorities who live at the economic margins of this country," said Paul Taylor, executive vice president of the Pew Research Center and an author of the report. "These data really show their economic vulnerability." Household wealth, also referred to in the report as net worth, is made up of assets, like a house, a car, savings and stocks, minus debts, like mortgages, car loans and credit cards. It is tracked by the Census Bureau in the Survey of Income and Program Participation, a broad sampling of household wealth by race and ethnicity. Nearly two-thirds of Hispanics' median net worth in 2005 came from home equity, according to the report, and when the housing market collapsed, so did their wealth. Median home equity for Hispanics fell by 51 percent in the period of the survey. The drop was compounded by the fact that Hispanics tended to live in the places that were hit hardest in the recession, like Florida and California, the report said. Armando Moya, a Mexican immigrant from Woodbridge, outside Washington, experienced these swings of fortune first-hand. For a few happy years, he believed he had avoided his father's fate of scraping by. He bought a house with a backyard and opened a taco restaurant with his brothers. His bank account was growing, and he took his family on vacations several times a year. Mr. Moya lives in Prince William County, where the Hispanic population more than tripled from 2000 to 2010, according to the Migration Policy Institute, with many newcomers working in construction trades that were flourishing in the rapidly growing suburbs of Washington. 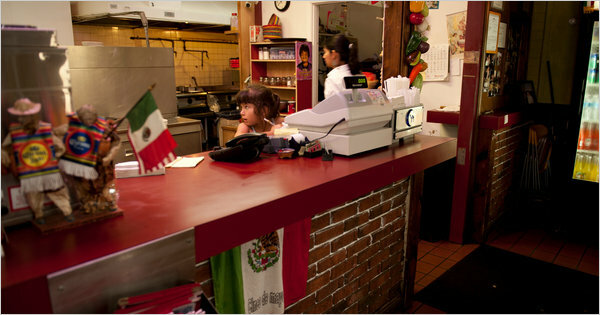 To capitalize on the influx, Mr. Moya, who is now 38 and had been working in restaurants since he came to the United States in the early 1990s, decided to start his own, and together with his brother opened Ricos Tacos Moya in 2005. In the same year, he bought a house valued at $350,000. His monthly payments were more than $2,300, and with hungry workers filling his restaurant, he managed. But when the collapse of the housing market swept like a wave through this Northern Virginia county, taking his house, and his bank account, and many of his customers along with it, he lost his middle-class lifestyle. "Everything was going down," he said. Now he is back where he started, living with his family in a rented apartment, and working seven days a week in the taco restaurant. His house sold for $135,000 to a couple from Morocco, he said. "My money changed," he said. "I lost my house." The share of Americans with no wealth at all rose sharply during the recession. A third of Hispanics had zero or negative net worth in 2009, up from 23 percent in 2005. For blacks, the portion rose to 35 percent from 29 percent, and for whites, it rose to 15 percent from 11 percent. About a quarter of all black and Hispanic households owned nothing but a car in 2009. Just 6 percent of whites and 8 percent of Asians were in that situation. Whites were less affected by the crisis, largely because their wealth flowed from assets other than housing, like stocks. A third of whites owned stocks and mutual funds in 2005, compared with 8 percent of Hispanics and 9 percent of blacks. The median value of stocks and mutual funds owned by whites dropped by 9 percent from 2005 to 2009. In comparison, the median value of holdings for those blacks who held stocks dropped by 71 percent, most likely because they had to sell when prices were low, Mr. Taylor said. The median wealth of Hispanic and black households is at its lowest point since 1984, when the Census Bureau first conducted the study, the report said. Mr. Moya counts himself lucky to still have his restaurant. He has to work weekends at a nightclub in Washington to keep up with his rent. His life is increasingly resembling his father's — subsisting, without saving — but he has pinned his hopes for a better life on his sons, and he has discarded the idea of returning to Mexico. "I want my house back," he said. "I'm working for my house right now."